A great urban experience is more than just concrete and glass and trees. It’s about people, united by a common vision, working together to make Midtown exceptional. Membership is our vehicle for collective action. Our members share an interest in the continued success of Midtown Atlanta and they help shape our agenda and our work. In an era of profound change both in the skyline and at street-level, our shared purpose is to make sure the urban experience gets even better as Midtown grows - today and in the future, on every level. Support the programs and initiatives that make Midtown your location of choice. 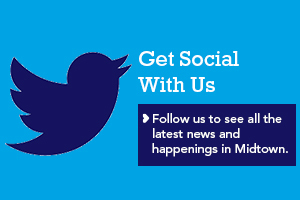 Stay informed, learn, connect and engage with other Midtown Alliance members at events we host throughout the year. Members receive special pricing for tickets to Midtown Alliance events, including our annual meeting. We have more than a dozen networking events planned for our membership this year. View our calendar here. Get timely communications with insight into projects and district issues, plus up-to-the-minute alerts that may affect you and your building, including street closings, traffic and events. Access district studies, maps, survey findings, reports and plans in our online Resource Center, updated regularly. Members earn 10% off at their favorite and newly discovered hotspots – more than 65 Midtown restaurants, retailers and service providers in all - through our “Meet me in Midtown” loyalty card program. In addition, members can download our Midtown Alliance Member App for iOS and Android to access nearby special offers from participating merchants. Take advantage of free services from our Midtown Transportation team that help workplaces use alternatives to driving alone, including discounted transit passes, financial incentives, personalized commute planning and other resources. In addition to a plaque and digital badge to identify their affiliation with Midtown Alliance, members receive online member directory and events listings on the MidtownATL.com website. Our Marketing and Communications team also works with members to amplify their major initiatives across many channels in our communications platform. Download our brochure to learn about the vision of Midtown Alliance. Learn more about Member Benefits. Take your next steps toward enrollment. Complete our no-obligation application to tell us more about your organization and how membership can help you meet your goals. Designate points of contact in your organization to work with us. Plan your organization’s involvement in upcoming member events and programs.